Autumn is just around the corner and pretty soon temperatures should start to drop and the leaves around my neighborhood will begin to change color and fall. I'm looking forward to its arrival. In the meantime, it's still bright and shiny in my neck of the woods. Figured I'd celebrate the clear skies while I can still enjoy them with some recent additions that feature two things I truly appreciate in our hobby: acetate and autographs. 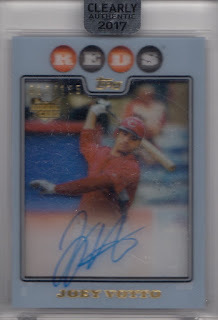 I've been trying to add a Joey Votto autograph to my collection for years. He's signed a few on-card autographs since 2014, but most of them are fairly low numbered which means they aren't exactly cheap. Now that they're are finally starting to saturate the market, prices have started to stabilize and in some cases drop. At the end of last month, I won this card off of eBay for $34.10 (+ $5.90 shipping). There is so much red in the background, I actually thought I was bidding on the red parallel. However when it arrived, I realized that this card isn't serial numbered to 50. Oh well... I was still happy to finally able to cross Votto off of my wantlist. 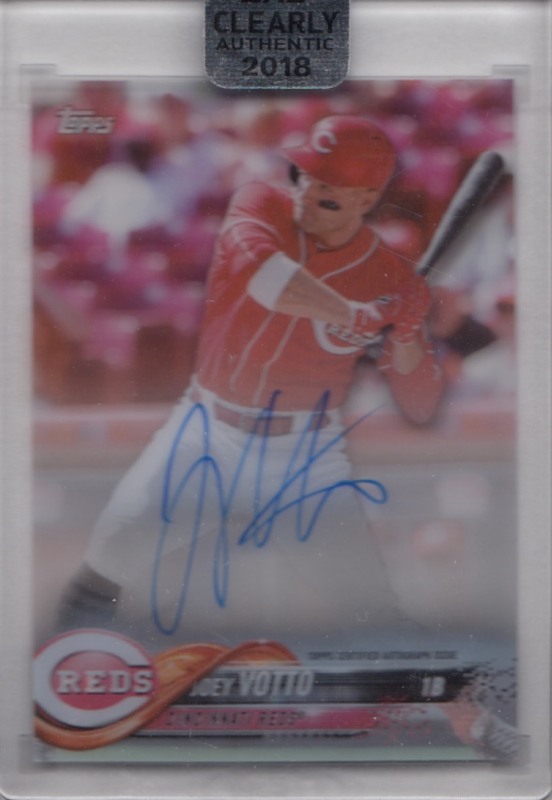 Although I like the look of the 2018 Topps Clearly Authentic Votto, I'm not going to lie. I totally was settling. The 2017 rookie reprint autograph was the one I really wanted. Unfortunately, they've been known to sell in the $70 to $80 range, which was a little too rich for my blood. Then I saw this one closing on my birthday, right before I was about to go out to dinner. I threw out a bid I was willing to pay and ended up winning it for $52.50 (+ $3.50 shipping). Four years of searching for his signature and I picked up two within a six day span. I have about ten eBay searches that I actually check on a daily basis. 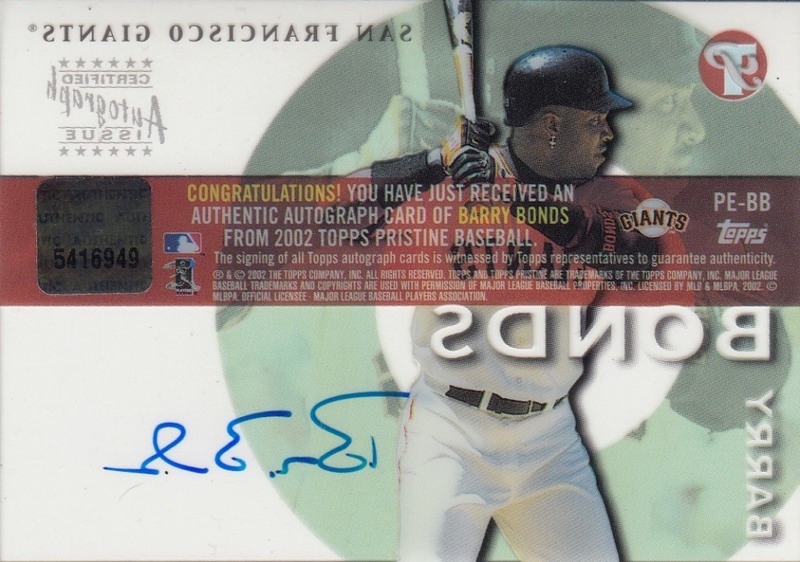 Barry Bonds autographs are one of them. Fans, collectors, and bloggers are divided when it comes to Barry Lamar Bonds. Although I don't condone the use of PED's, I've accepted that they were part of the game and feel it's not realistic to remove two decades worth of baseball history from the record books. Throw in the fact that I had the pleasure of seeing Bonds play on a bunch of occasions and each time he stepped into the batter's box, he brought fans to the edge of their seat. I can't ignore my past. Nor will I ignore his greatness. I realize the evening is approaching for many of us, so I'll focus my attention towards tomorrow. Here's to a bright, sunshiny Friday. I love the oxymoron Clearly Authentic Reprint. Cracks me up. Lol. Sadly... I didn't do that on purpose. Hey, blame Topps. I love Clearly Authentic but hate the dumb name. But yeah, love the Vottos and the Bonds.. congrats on the pickups! Those two Votto cards are stunning. I was able to land him TTM a few years back, and I think that will serve as his representation in my autograph collection for the time being. At some point I'd like to add a certified AU to my PC of him, but as you noted, prices aren't exactly friendly sometimes. ERIK KARLSSON IS A SHARK!!! I don't think I've seen the Pristine acetate cards before. Really cool! I was shocked to learn recently how infrequently Votto has signed. He's one of those quietly great players. 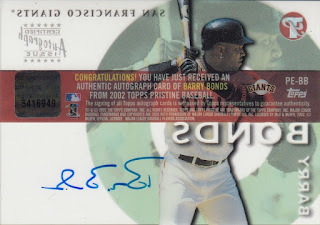 That Bonds auto is very cool. Those are some fantastic Votto autos Fuji! Yeah, you can’t just ignore that stats from that era of baseball. If MLB wanted to fix it so bad, they would have done something about it for sure. Nice cards!! Those Rookie Reprint Autos from Clearly Authentic are definitely a favorite of mine. I pulled a Doc Gooden from my case and it's just such a cool looking card/ Nice stuff Fuji! defgav - that works. i have a reputation for blaming topps. community gum - votto's ability to get on base is amazing. glad to see he has started signing more and more the past few years. reds card collector - thanks! gca - thinking of all of you on the east coast. hope you're weathering the storm and your family and friends are safe. chris p - i think there are a lot of other collectors who'd agree with us. explains the prices they often command on eBay. 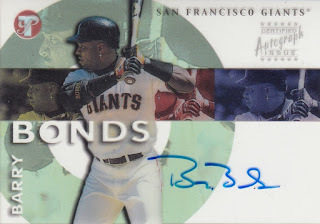 Love that Bonds auto, congrats on all 3 cards, they are beauties. These acetate cards are beautiful Fuji!!! I love the Clearly autographs a lot, but I love that Bonds Topps Pristine autograph. That was a great a great looking set of autographs. arpsmith & snorting bull - just can't pass up a bonds on-card autograph that's $60 or less.